Hugh Lennox was the son of Eccles and Martha Lennox. Eccles Lennox & Martha Tomb were married Sept 1881 in Glasgow. They had 16 children. Hugh was born on 11th April 1892 in the Bellaghy. Some time between 1892 and 1897 the family moved to Cookstown. Hugh Lennox attended Oldtown National School and he worked at the nearby Millburn Factory. Hugh was well known in Cookstown as a football player. Hugh moved to Glasgow, where he joined the army, estimated to be around 1909. 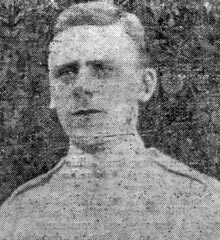 Hugh Lennox was serving with the 1st Battalion of the Argyll and Sutherland Highlanders when he was wounded in Salonika on 30th September 1916. 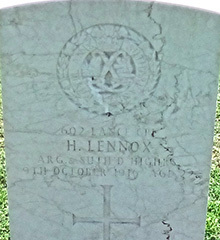 Lance Corporal Hugh Lennox died of his wounds on 9th October 1916. He was 24 years old. The Cemetery is on the northern outskirts of Thessalonika, it lies on the west side of the road to Serres, Langada Street, adjoining the Roman Catholic, French and Italian War Cemeteries. 6 Reference to Hugh's father's murder Hugh's father was shot dead in a railway car. 7 Reference to Hugh's parents Reports on Hugh's father Eccles murder in Canada. 8 Reference to Hugh's parents Hugh Lennox was one of 16 children.